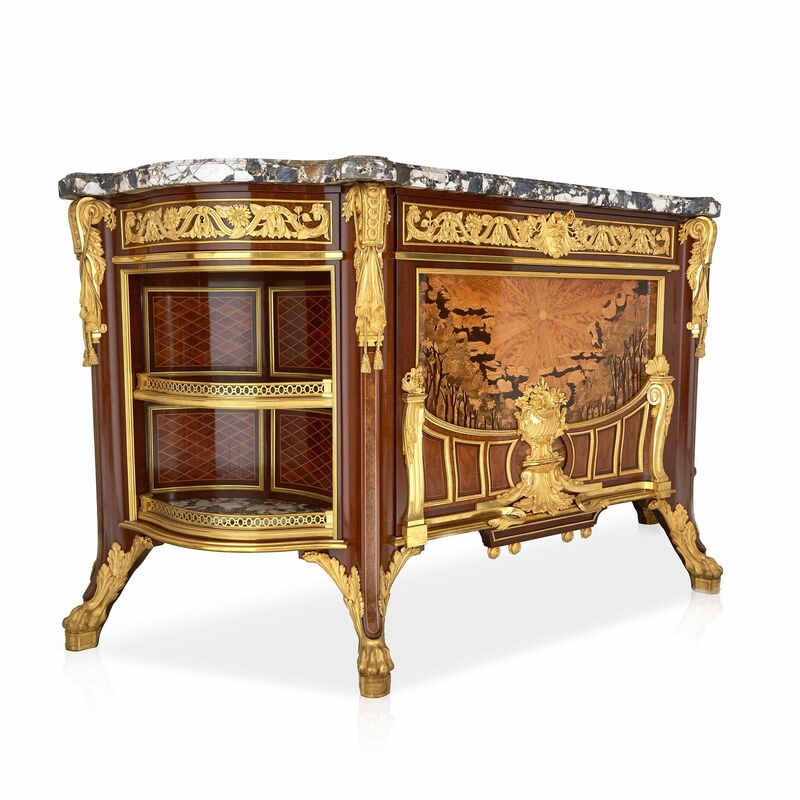 This exceptional, museum-quality side cabinet, known as the 'Meuble Soleil', is one of Francois Linke's most unusual and most beautiful designs. 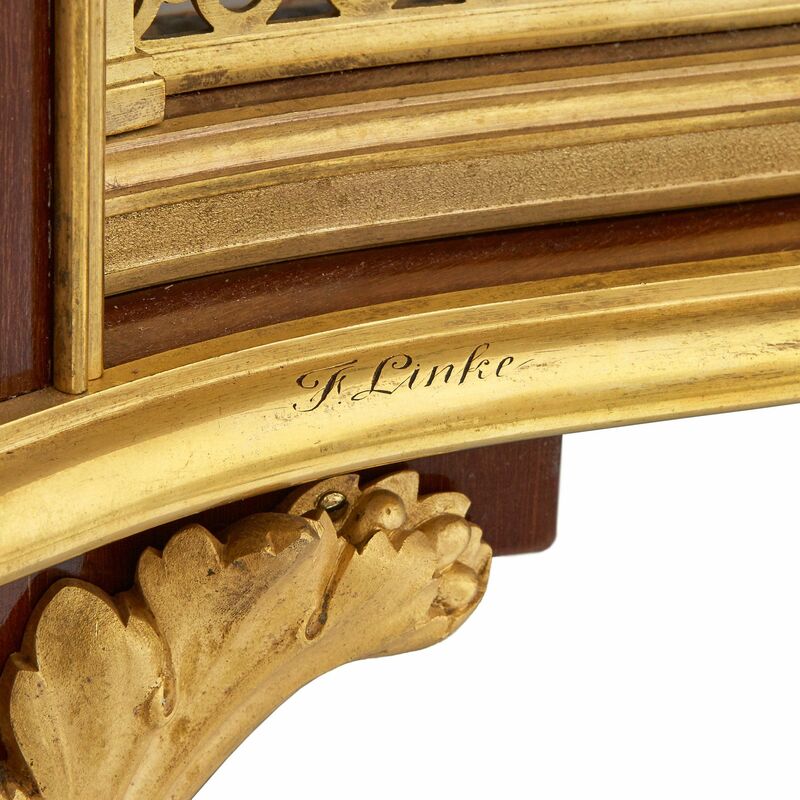 Francois Linke is considered one of the most important cabinetmakers of all time. Linke was born in the Czech Republic but was mainly active in Paris in the late 19th and early 20th Century. His designs often drew on earlier Louis V and Louis XVI styles of furniture, but he was also influenced by modern trends, such as the Art Nouveau. Linke exhibited at numerous fairs and International Exhibitions, where he won many awards for his furniture. 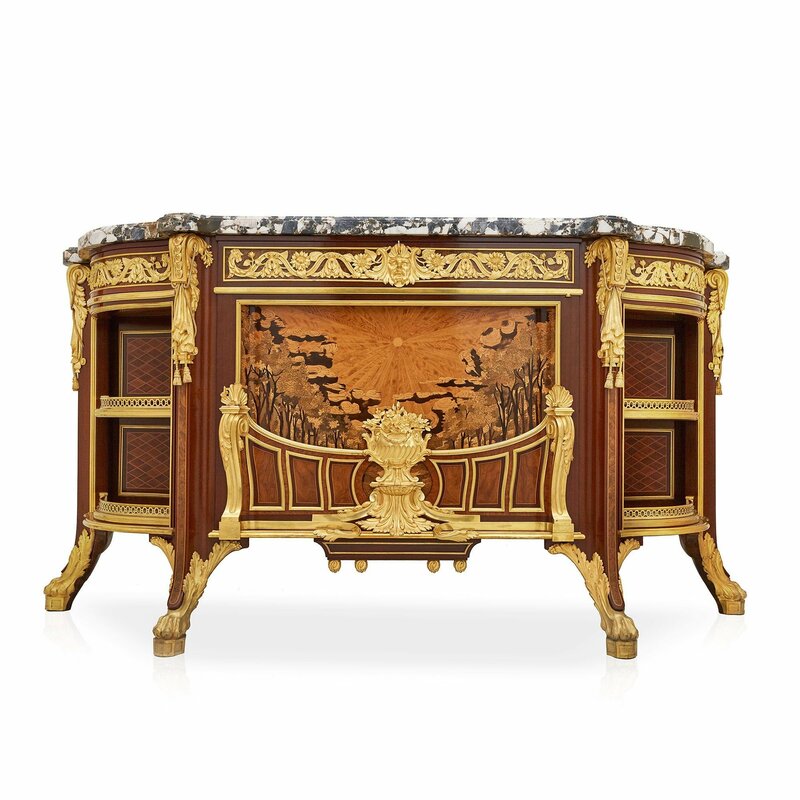 The undulating body of the cabinet is topped with white breche, or flecked, marble. Beneath the marble top, there are three drawers, each one mounted with an ormolu frieze of scrolling foliage which terminates in cockerels' heads, and which features sunflowers and a mask at the centre. 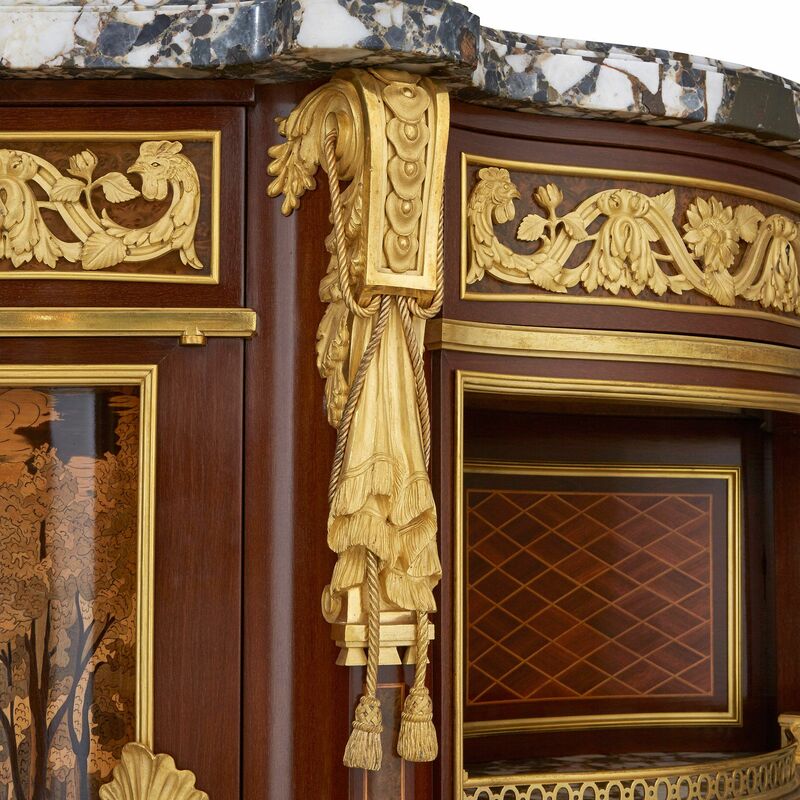 The upper corners of the cabinet are mounted with scrolling brackets and tasseled drapery. 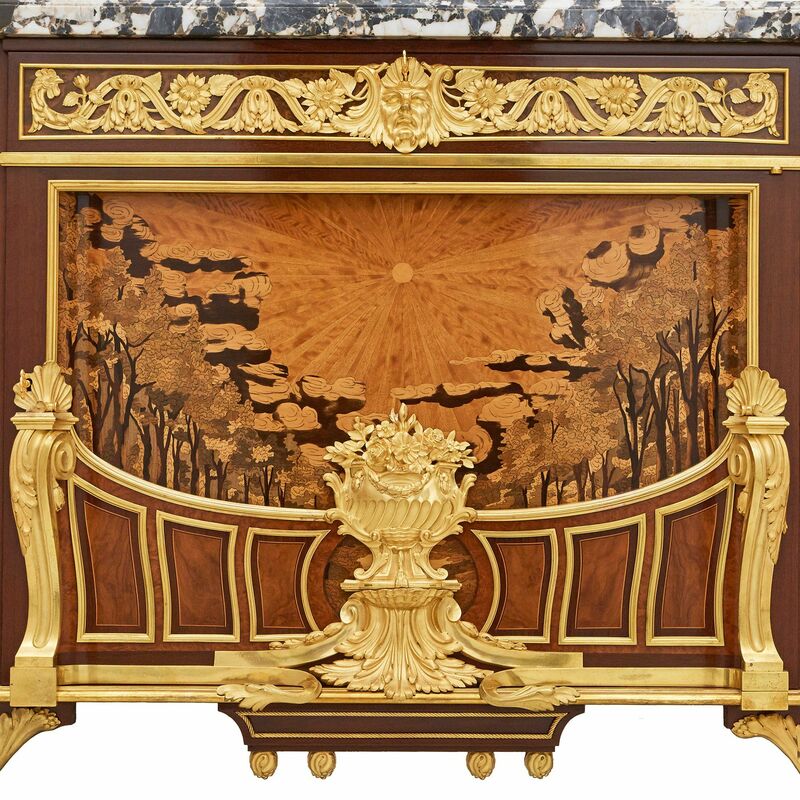 Below, the central cupboard drawer features a beautiful marquetry panel which depicts an avenue of trees, illuminated by a bright sun, positioned above. The drawer is further decorated by a central ormolu urn full of flowers, and by two ormolu shells atop scrolling brackets either side. A pair of marble-topped shelves flank the central cupboard, each fronted by an ormolu gallery and set against diamond-form parquetry backing. The cabinet is supported on four outset legs which terminate in ormolu paw feet, set on small plinths. The cupboard was crafted by Linke after a design by Georges-Francois Alix, a contemporary furniture maker, itself based on an 18th Century commode by Jean-Henri Riesener. Alix's design, called the 'Meuble Soleil' ('Furniture Sun'), was purchased by Linke who altered and reinvented it to create this masterpiece. Linke made four versions of this piece, one in 1910, then another in 1912, 1926 and 1939. This cabinet is one of the earlier two versions. The lower right molding bears the signature 'F. Linke', and the lock-plates are stamped 'CT LINKE / SERRURERIE / PARIS / 1605'. Ledoux-Lebard, D., Le Mobilier Francais du XIXe Siecle (1984), Paris, p. 25. Payne, C., Francois Linke: The Belle Epoque of French Furniture (2003), Woodbridge, p. 436.